Ranchos, first established during Spanish rule and later continued under the Mexican flag, were large land grants given to individuals who had been loyal to the Spanish Crown or later to the newly independent government in Mexico. For decades, there was an effort to populate the territories of Alta California and Ranchos became the system of choice. Some ranchos were awarded during the mission period, but the vast number of Alta California ranchos were awarded after secularization of the missions in 1834. The English word ranch is derived from the Spanish word rancho. These land-grant titles in Alta California were government-issued, permanent and unencumbered property ownership rights to land. For the most part, ranchos were devoted to raising cattle and sheep. Rancho workers often were the Native Americans who had been former mission residents and who had learned Spanish from the missionaries. Ranchos developed land use patterns that are used today throughout Alta California. Much of the land development in the 20th and 21st centuries follows the boundaries established by the ranchos, and frequently use the name of those ranchos. One of the first ranchos awarded in Alta California was that of Rancho San Pedro – given to Juan José Dominguez by Spanish Governor Pedro Fages. From this rancho evolved the city of Dominguez Hills among other western L.A. cities. 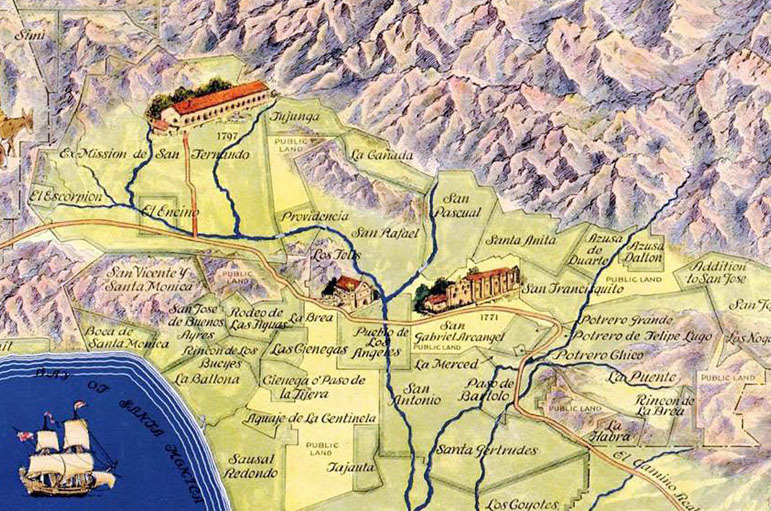 One of the largest land grant rancho owners in Alta California was former Santa Barbara Presidio commandante Jose de la Guerra y Noriega who was awarded ranchos from present-day Thousand Oaks to Cuyama just east of Santa Maria. His descendants still operate land that was part of these “rancho” land grants at San Julian and Cuyama.